NI LabVIEW and chipKIT Digilent UNO32 are powerful tools that offer enormous potentialities. Remote monitoring and webserver capabilites of LabVIEW further enhance our projects. LabVIEW Interface for chipKIT Digilent UNO32 Development Board. A further enhancement with bluetooth monitoring and Webserver for remote viewing is an interesting proposition that will dwell upon here. UNO32 must be connected to an adequate external power supply (my highly stable power supply is set 7,5V dc). 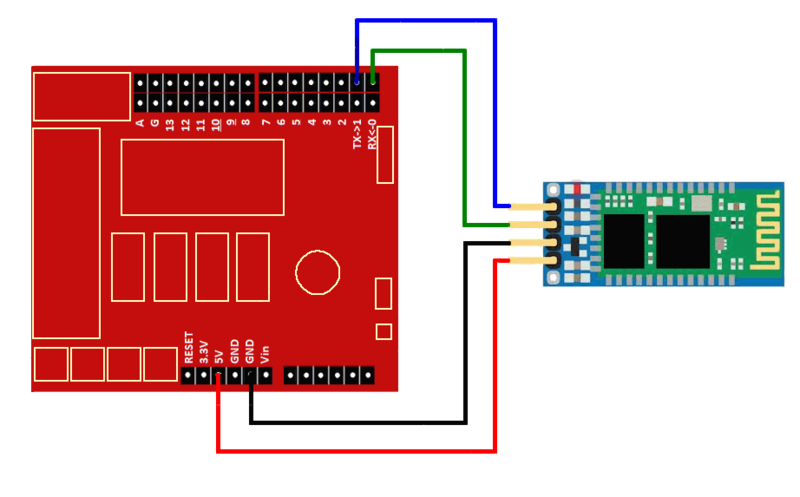 Once UNO32 is powered will see a blue LED blinking on your JY-MCU module. 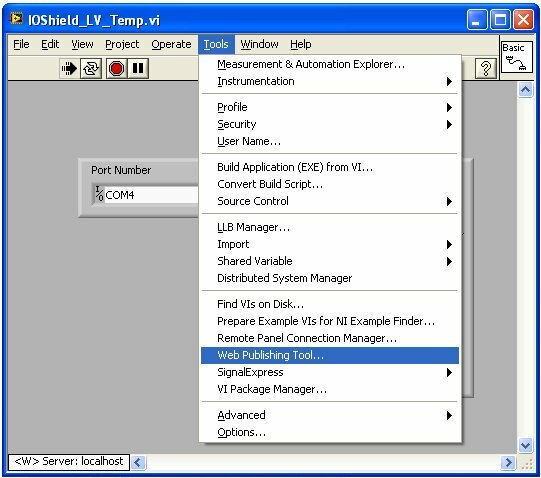 Basic I/O shield must be installed on top of UNO32. Check the tutorial here in this blog LabVIEW and VISA interface, with chipKIT Digilent UNO32 and Basic I/O Shield for setting up the LabVIEW, VISA and installing firmware in UNO32 with MPIDE environment. I have blurred the MAC address of my bluetooth module. After introducing the password click the OK button. You will see linvor connection changing to green. We are ready to run our IOShield_LV_Temp.vi. 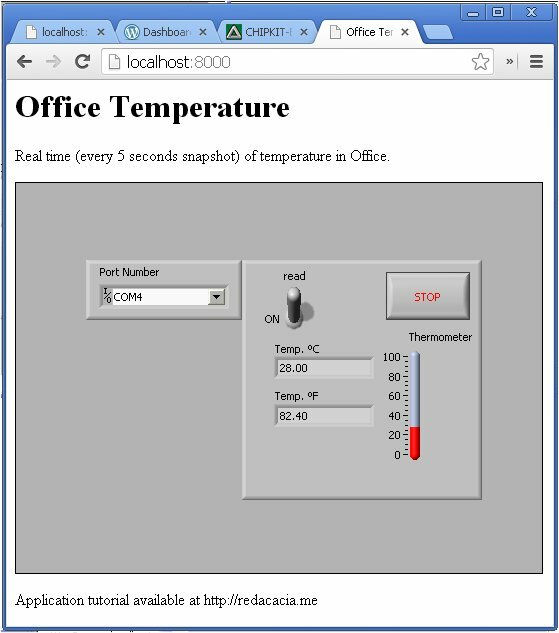 You can download it from free repository Bitbucket, by clicking on the link IOShield_LV_Temp.zip. 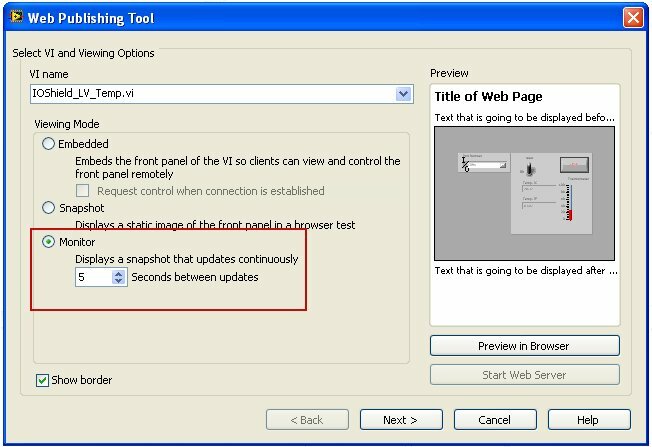 The zip file you will download contains the VI we wrote in previous tutorials. 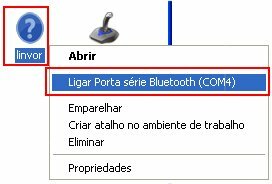 Set the port to your bluetooth module’s (in my set up it is COM4). You can view the VI being run, with Ctrl + E in your keyboard. In Block Diagram click on Highligh Execution button . It will show you the VI being run in slow motion, and any errors that may occur for debugging purposes. 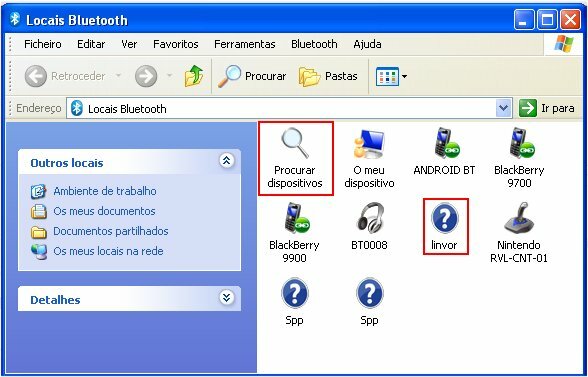 Here leave the default location as it is, but change the file name to index (by default it will be IOShield_LV_temp). Click Save to Disk button. 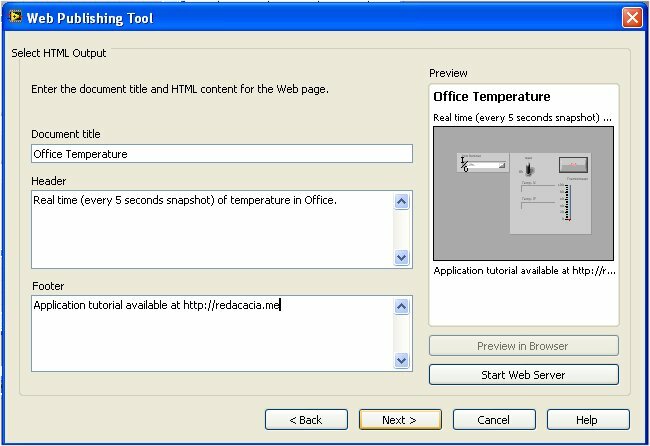 Press OK button on Document URL pop up window. Web Publishing Tool will close. If for any reason, the webserver does not start automatically, do Tools -> Web Publishing Tool, and then click Start Web Server button. 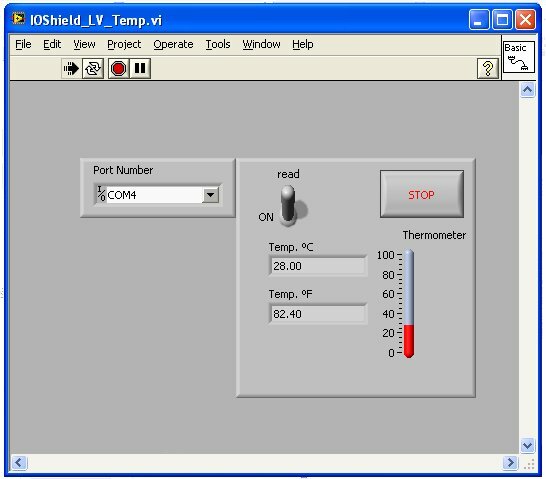 We have achieved remote temperature viewing of temperature read by our chipKT Digilent UNO32 from the temperature sensor on Basic I/O shield. 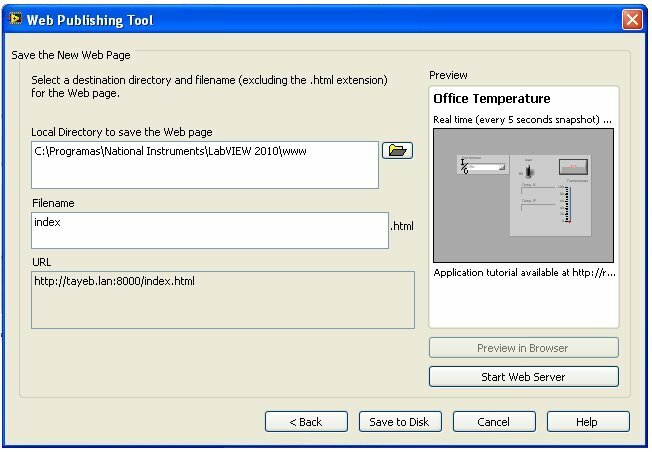 LabVIEW is now publishing a Webpage of the fornt Panel of VI that can be accessed from outside by doing Port forward in one’s router. We have shown again the potentialities of LabVIEW and chipKIT UNO32 development board. For further reading I suggest you visit NI’s website. I shall appreciate any comments and suggestions. I will also appreciate if you point out any errors or omissions. This entry was posted in Electronic Projects, Programming and tagged BASIC I/O, Bluetooth, chipKIT, Digilent, JY-MCU, Microchip, NI LabView, NI VISA, PIC32MX, Remote, Temperature, UNO32. Bookmark the permalink. Welcome to my blog. Well, your school is investing in future generation of engineers and scientists. You are using very powerful tools. Technology is being desmystified at your school! Very good indeed! 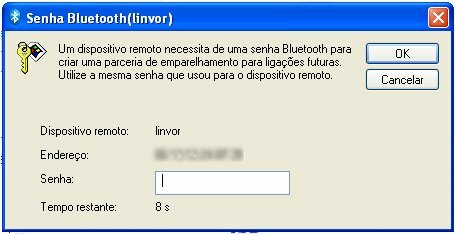 please give me a labview project using DAQ . Wa-alaikum-as-salam. Welcome to my blog. Check here in this blog Home Alarm project. You can change it and do something else. Thank you for the great tutorial project. I work for Digilent Inc and we shared this project on our social media.